For example. the Solio Hybrid Solar Chargers. (see previous post) come in two designs: the Solio Classic, which unfolds three panels like a flower and is rated at 6 watts, to recharge a mobile phone up to two times ($99), and the rugged and weatherproof Solio Hybrid 1000 (shown here), with a carabiner-clip handle (3.6 watts, $79). There's also a new higher-power Solio Magnesium Edition, designed like the Classic, but withiGo compatible Adapter tips (9 watts, $169). Then there's the HYmini Universal Charger/Adapter, an interesting alternative that combines a battery with a fan turbine to change with wind power ($49). You also can connect up to 4 miniSOLAR panels to charge from the sun ($24 each), or use the miniHANDCRANK generator ($9). The HYmini Deluxe bundle includes the charger and a panel ($74). However, the HYmini products are not designed for rugged use -- the charger is somewhat moisture-proof but not water resistant, and the solar panel is packaged in recycled cardboard paper, so needs to be kept dry and clean. 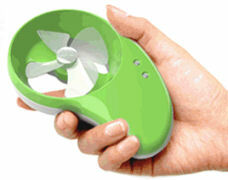 The fan provides supplemental power, not a full charge, and while it is designed to charge at speeds from 9 to 30 mph, the blade will break off if you push it harder. As a result, think of the HYmini products offer a fun way to experiment with renewable power for activities like riding a bike to work (in good weather), with a solar boost when you get to your office, but not for serious camping. 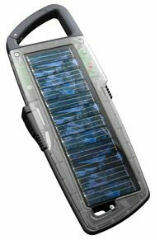 See my Portable Power Accessories Gallery for more on solar and other power options. This entry posted on February 4, 2009. Previous: Netbook or Notebook or Not: Sony VAIO P Lifestyle PC. Next: Wireless Power: Powermat and WildCharge.